Habitat: Blacktips often come inshore in large schools, particularly in association with Spanish mackerel. 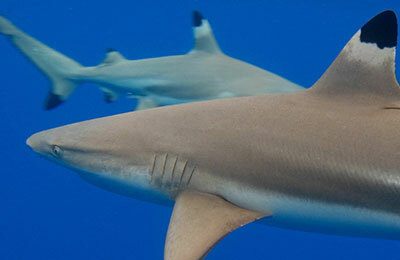 Frequently the most common shark in clear-water cuts and along beaches in Florida and Bahamas. Fishing Tips: Blacktip sharks are sometimes caught by sport fishermen off the beach or offshore They provide a good fight, often leaping out of the water. State Record: 152 lbs. (blacktip).